A few weeks ago I was visiting a friend here in Malaysia. As being a Dutchman, I love to eat bread. However, the bread here in Malaysia is not to the standards, at least it is not for me. I was in Penang to help my friend with her website: My Island Penang.com. She's a Chinese Nyonya and her husband is an Indian. To my surprise they were big bread fans. Not only they love bread, many people in Malaysia love bread. They love sweet white breads with filling. I don't consider this as good bread, not in the terms I love bread. But hey, I am not Malaysian. My friends bake their own brown bread. Healthier and much better then the white breads you can get here. I stayed at their place and in the morning I was already making myself happy with the idea I would have bread for breakfast. I never eat bread in Malaysia, because I think the local foods like nasi lemak, laksa, mee rebus and many other dishes are so much better then the local white breads. This morning I was ready to have brown bread. To my never ending surprise my friends put sambal udang kering on the table. "This is probably the best thing to put on the bread", they said. I couldn't believe it! 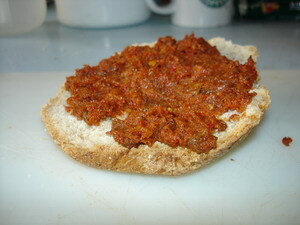 Sambal on bread, and then for breakfast!!! I thought they were out of their mind. But, curious as I am I tried and I learned quickly it was not them being out of their minds, it was me! Brown bread with homemade sambal udang kering is almost as good as brown bread with mature Dutch cheese! bicycle adventures I can tell I have tried many different dishes. This one was for sure the most unexpected dish and one of the best breakfasts I ever had. LOL welcome to our world friend!! must agree with you though that the white bread in Malaysia and Singapore is very sad. I make my own chewy crusty bread, slow risen bread too - with NO sugar!!!! Cheers!